This special combination of Red rice and Karuppatti is delicious and healthy. This rice can be replaced in the place of raw rice while preparing pongal.It can also be used sufficiently by people who suffer from diabetes.Palmyra Sugar is not Sugar free or low calorie sweetener, it is a Low GI(Glycemic Index) Sweetener. Palmyra sugar has lots of therapeutic value. It is an essential part of many Ayurvedic medicines. Palm Sugar is good for problems relating to breathe, like asthma, cold, cough, Anemia, Leprosy, typhoid, and high Blood Pressure. It supports growth of young children, decreases pancreas heat, strengthens heart, bone and teeth; help prevent diabetes, arthritis and respiratory ailments. Palm Sugar is alkaline and not acidic. Alkaline foods are healthier than acidic food. Unlike white sugar this does not make the children hyperactive nor does it lead to hypoglycaemia.Please click the below link to know more about it…. Red rice is used to prepare versatile dishes like Pongal.Puttu,Uppma,Kheer Paniyaram,Dosa and many more……. Red rice is a type of unpolished rice that has higher nutritional value than white rice or polished rice. Cooking time is usually longer than white rice and has a nutty flavour and sweeter taste. It is rich in fiber content, Vitamin B1 & B2, iron and calcium. Owing to high nutritive content and health benefits of red rice, it is highly recommended for heart patients and diabetics. It is also popular among health freaks and fitness enthusiasts as its high fiber content helps gain less weight. 1.Soak red rice for an hour,Boil 6 cups of water,cook red rice, soft in a pot or cooker for 3 to 4 whistle.Mash when its hot to make it more soft. 2.Take a pan add 1/2 cup of water and add grated Palmyra sugar(Karuppatti) stir until it melts. 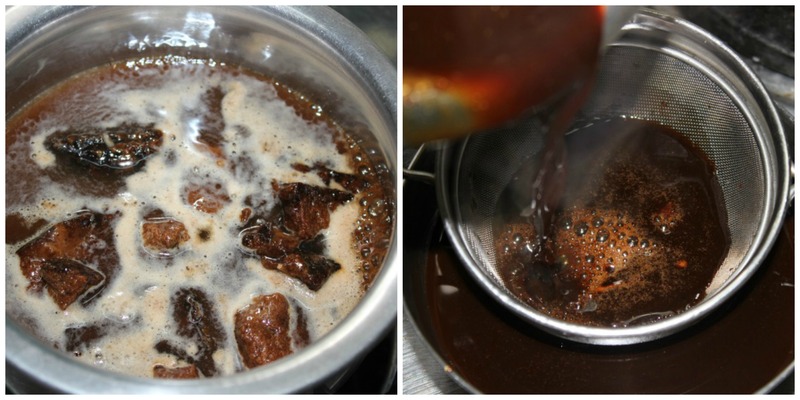 3.When it cools down filter the sugar syrup and boil it with grated coconut, for 3 more minutes. 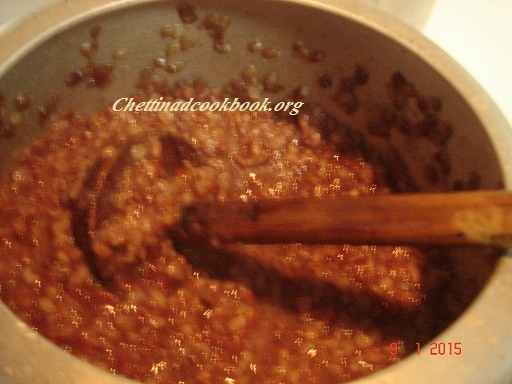 4.Add this syrup to soft boiled red rice,mix well. 5.Heat another pan with 1 tbsp of ghee,fry cashew and dry grapes to golden brown. 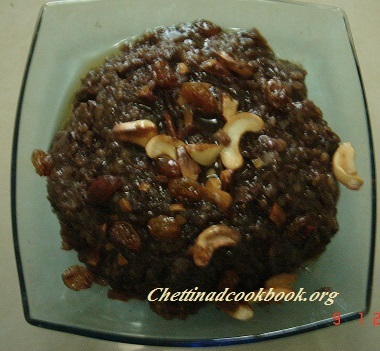 6.Add this to prepared Pongal then add Elaichi to it mix all together.Add more ghee if you prefer. Very nice to note that you have explained the significance of KARUPPATTI and its salient features. People will certainly prepare & enjoy ! Long live your service !